This recipe is courtesy of my Aunt, RoseMarie, who makes the best smoked salmon and cognac cream pasta on the planet. She serves it as a delicious small plate starter or as a main course delicacy when she has the family over for dinner. The cognac cream sauce really enhances the luxuriousness of this dish. Whether you’re looking for delicious lent recipes or just have a hankering for a creamy pasta dish, look no farther! Family recipes hold special virtu, like a specific “food identity” assigned to the people who make them. I can’t get enough of Myne’s Puffs or Northern Neck crabcakes, Aunt Lynne’s Famous Pumpkin Bread, my cousin, Katrina’s Savory Mushroom Tartlets, Madou’s Pate De Campagne or Mom’s Guava Jam. These are the dishes they’re known for, ones that are intrinsically linked to their styles, tastes and even lineage. 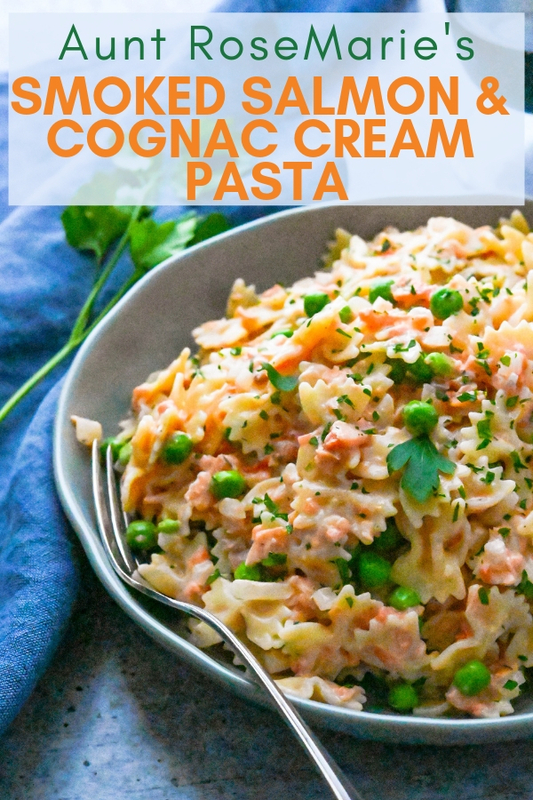 Happily for me, my relatives like to share and I know you’re going to love Rosemarie’s Best Smoked Salmon and Cognac Cream Pasta. The cognac cream sauce for this pasta dish is subtle but rich. It’s also pretty simple to make (I like that). RoseMarie’s sauce starts with very ripe tomatoes. Not canned. Fresh. 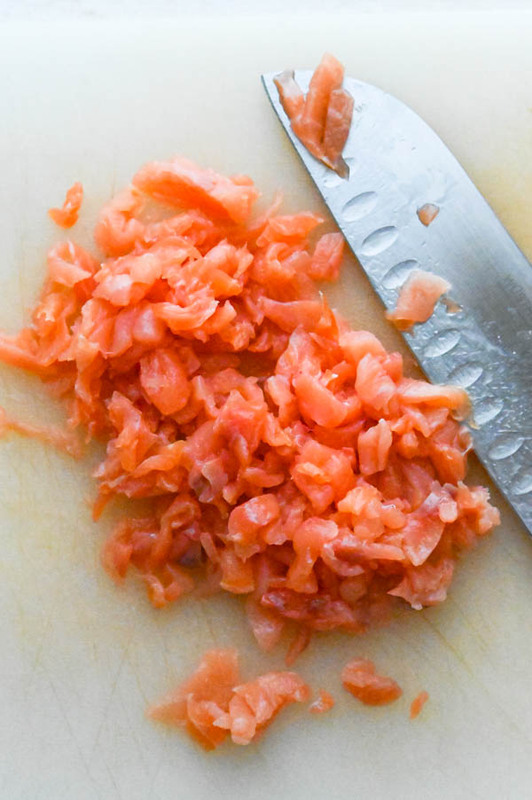 Slice a shallow “X” on the bottom of the tomatoes with a sharp paring knife. Carefully place the tomatoes in the water and cook for about a minute. Use a spider or slotted spoon to transfer the tomatoes to an ice bath to shock them. Remove the tomatoes from the ice water and pat dry. Peel the skins from the tomatoes (they’ll come off very easily). Cut the tomatoes in half and remove the seeds. Chop the tomatoes into a very fine dice. In a skillet, sweat the onions with a little butter and olive oil for a few minutes until tender. Add the tomato pulp and simmer until most of the juices have been given up and the mixture is thick. Add the diced smoked salmon to the tomato mixture. Good smoked salmon is a luxury item and it can cost as much as $12 for a 4-ounce package. A bit rich for my blood, so for me, the best smoked salmon is one that’s affordable. I like to buy my smoked salmon in bulk at Costco, where I can get a full pound of salmon for about $15. This recipe only uses about 3 ounces of the fish, which leaves plenty leftover for omelettes, crostini, and breakfast sandwiches later. After warming the salmon in the tomato mixture, stir in the cognac and cream. Sprinkle in the chopped parsley. Stir in the peas. (I use frozen peas because they’re the easiest, but I like to take them out just before I start making this dish, so they have a chance to thaw a little. Add the cooked al dente pasta. Toss well to coat and serve. 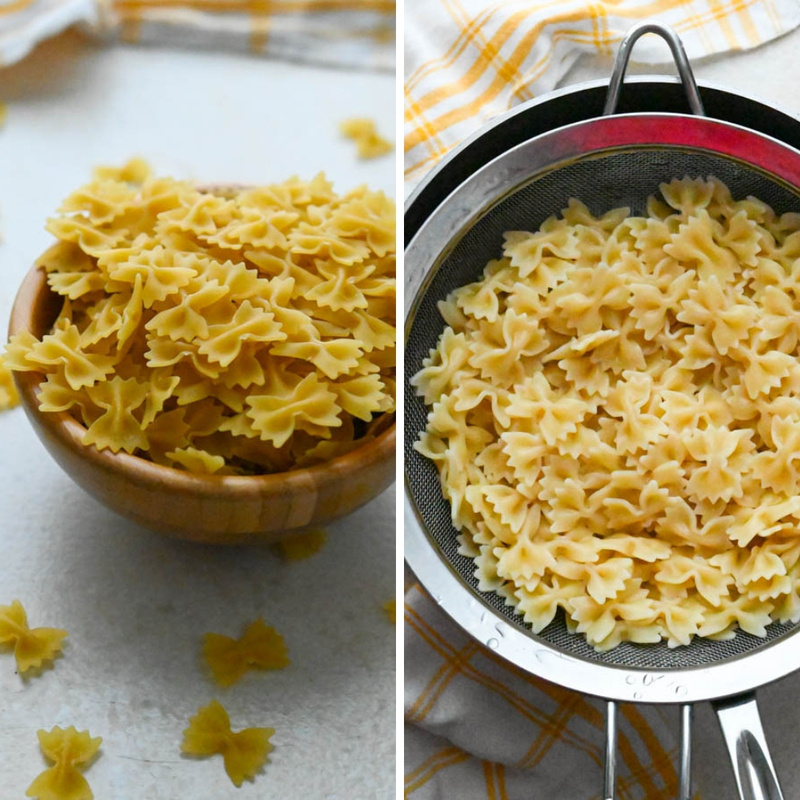 My Aunt likes to use mini bowtie (farfalle) pasta for this recipe and I have to agree, it’s the perfect size and shape. Barilla makes it, but I’m sure there are other brands that stock it too. Or any small tube pasta. Cook the pasta to al dente according to the package directions. Since the cognac cream sauce comes together so quickly, I like to get the water boiling for the pasta just before I start on the cream sauce. 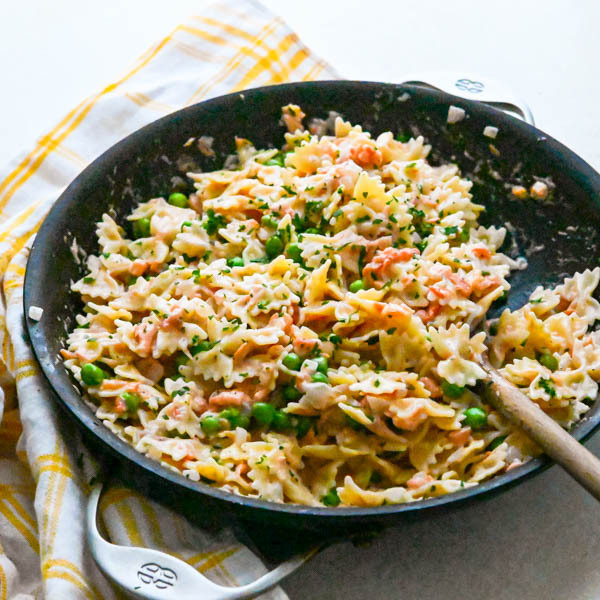 Don’t you agree that this is the best smoked salmon and pasta cream sauce you’ve seen in a while? 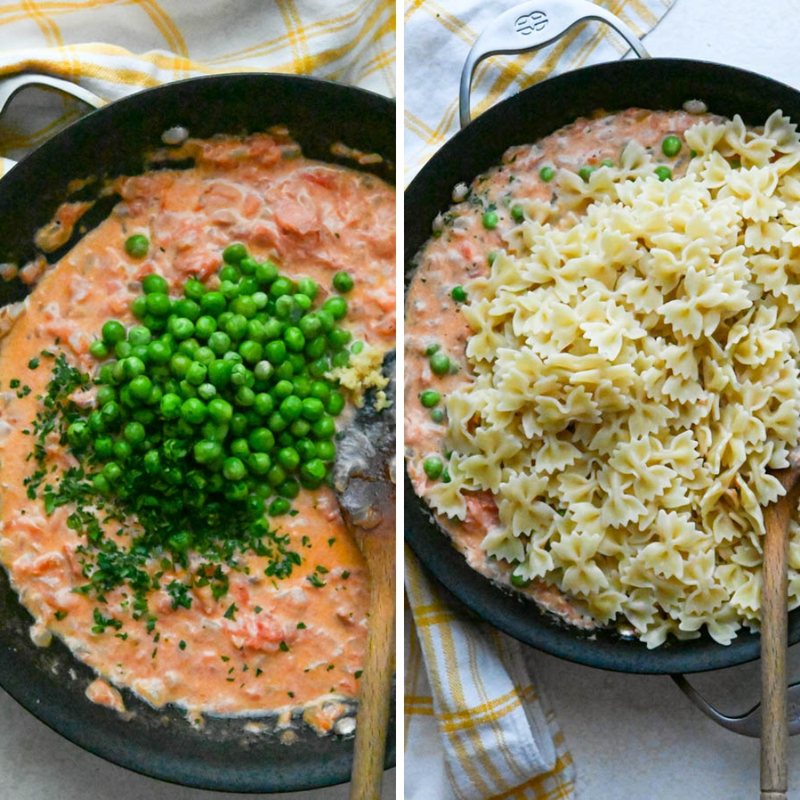 Each nook of the farfalle pasta, the salmon and peas are coated with that decadent cognac cream sauce. It’s truly a luscious dish and you can make it as fancy or as simple as you like. Fancy it up by serving with a flute of sparkling wine as a first course when you’re entertaining the boss. Use it as a simple lent recipe or a quick and easy weeknight pasta dish with a green salad and chilled white wine. It’s great heated up for lunch the next day. To heat in the microwave, add 1-2 tablespoons of cream and a small pat of butter. Heat for 45 seconds, stir and heat again. Re-season with salt and pepper as needed. This is one of my all time favorite pasta recipes and I want to thank my Aunt for sharing it with me (and you). Try it for Easter or Mother’s Day. You’ll be glad you did. My Aunt RoseMarie's recipe, this creamy pasta dish is about subtlety and indulgence at the same time. The cognac tomato cream sauce naps the al dente pasta and the smoked salmon. 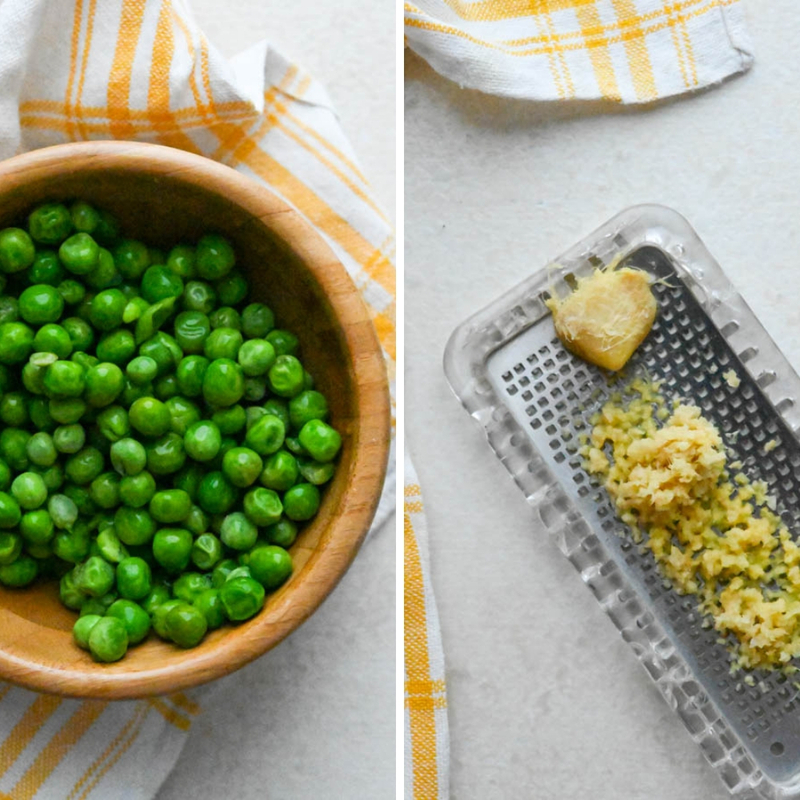 Frozen petite peas add a pop of color. This dish reminds me of Spring. Bring a small pot of water to a boil. Cut a shallow "X" on the bottom of each tomato and add to the boiling water. Cook for 30 seconds to a minute, just until the skins start to loosen. Use a slotted spoon or spider to remove the tomatoes from the water and let rest until cool enough to handle. Use a paring knife to remove the skins from the tomatoes. 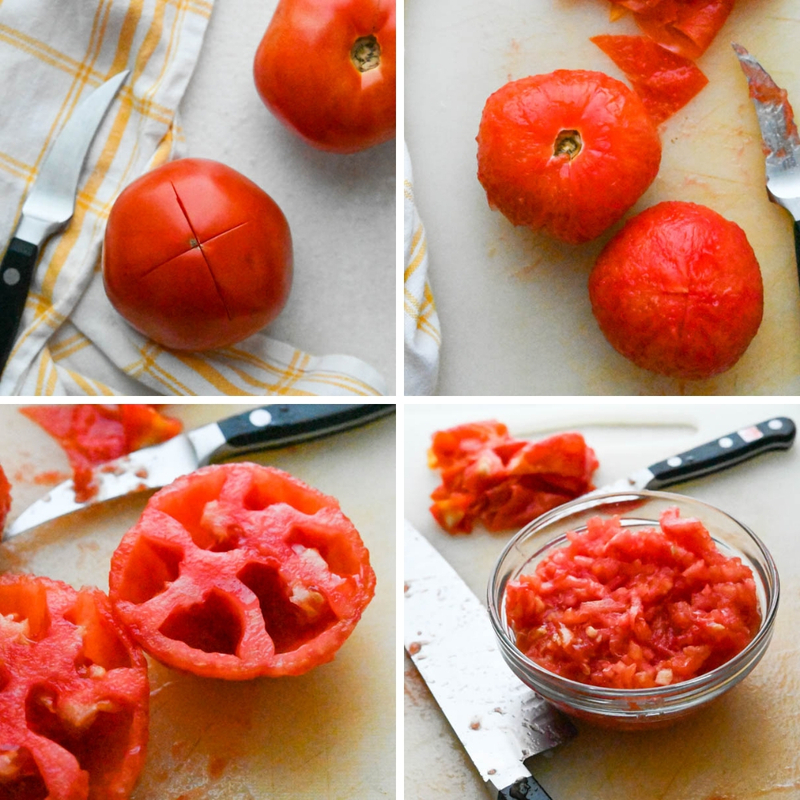 Cut the tomatoes in half crosswise and remove the seeds. Finely chop the tomatoes. Do your mise en place BEFORE making the cream sauce. Grate the ginger, chop the salmon, thaw the peas and have everything in place, ready to go. Cook the pasta to al dente according to the package directions. When pasta is ready, drain, but don't rinse. 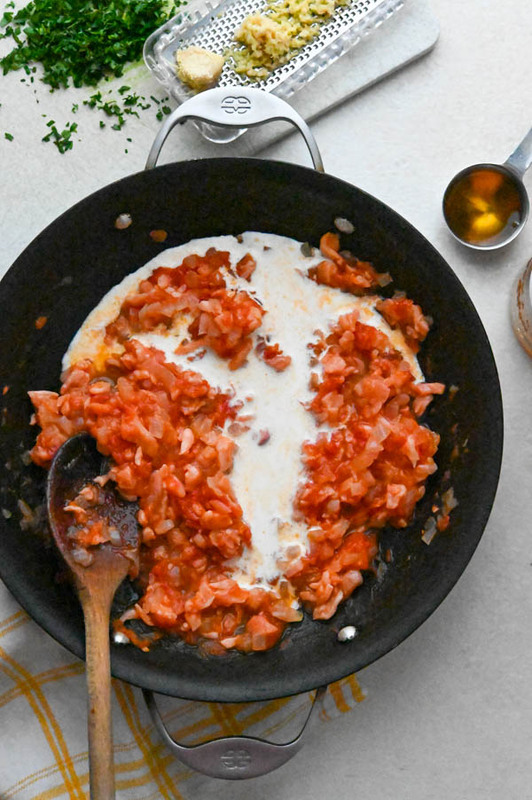 While the pasta is cooking, make the Tomato Cream Sauce. In a saucepan over medium low heat melt the butter with the olive oil. Stir in the onions and 1/4 teaspoon kosher salt and cook for 3 minutes or until the onions are transclucent (do not brown). 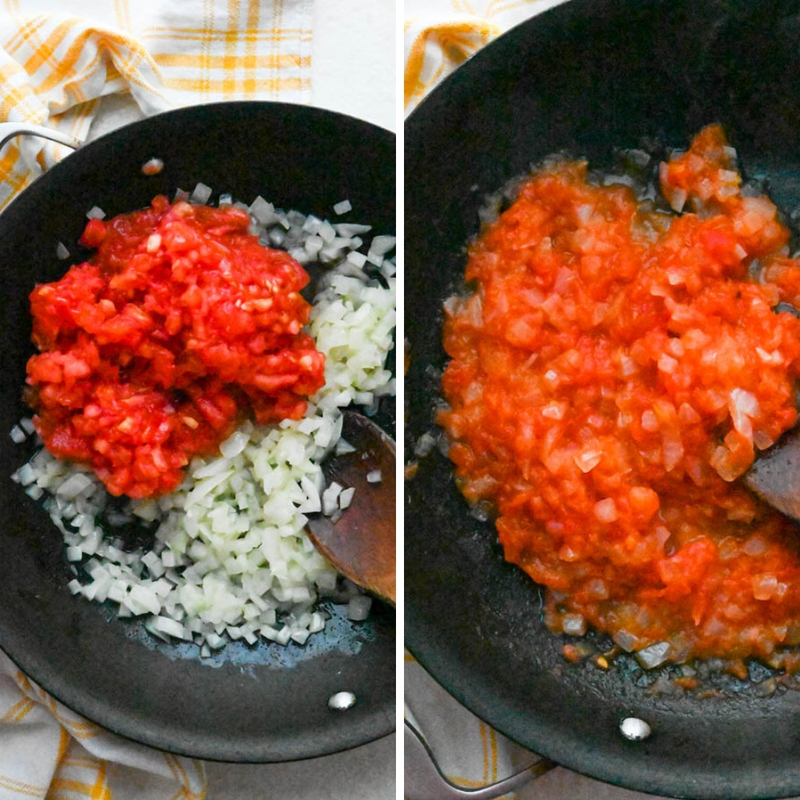 Increase the heat to medium and stir in the chopped tomatoes and the remainder of the salt. Cook for an additional 3-5 minutes until some of the liquid has simmered off and the sauce is thick. Stir in the salmon until just heated through, then add the heavy cream, cognac, peas, ginger and parsley. Cook for an additional 1-2 minutes to heat the ingredients through. Add the cooked pasta to the sauce and toss to coat. Adjust seasonings with additional salt and/or pepper as needed. Finish with additional chopped parsley if desired. Serves 2 as a main course or 4 as an appetizer. Recipe can be doubled. Pin “Smoked Salmon and Cognac Cream Sauce” For Later! Always looking for new salmon recipes and this has peaked my interest…I’ll let you know when I do try it. The colors and flavors of this dish are amazing! So bright and fresh! Love the tips on what to make with any leftover Salmon that you get for a great deal – very helpful! I love a good pasta recipe! Thanks for sharing, looks delicious! 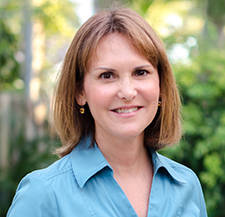 Wow Lisa, this sounds amazing! You had me at cognac cream and pasta lol. It looks so gorgeous, I gotta try it. I made this and it is just as described! Easy, beautiful and, most importantly, delicious! Isn’t it? Can’t get enough! 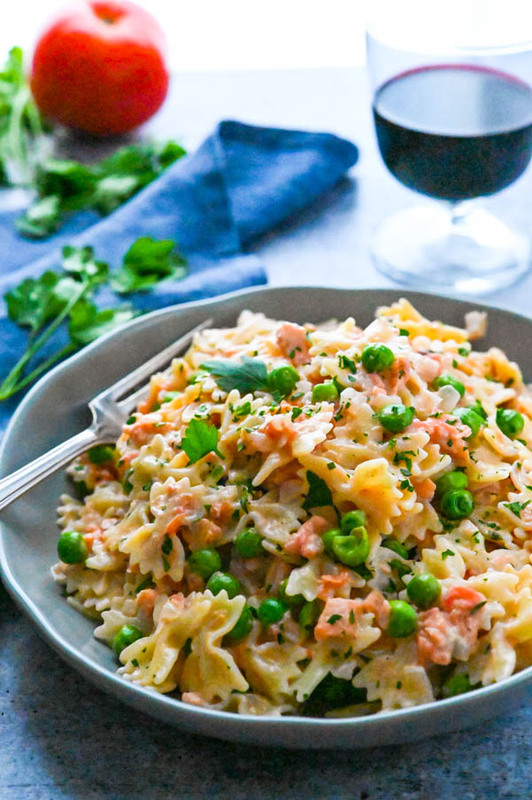 This is like a classier version of tuna noodle casserole… Love it! I almost spit out my wine when I read that, but yes — classier tuna casserole!